How would you like a Seaboard with a built-in sound engine for free that fits in your pocket? 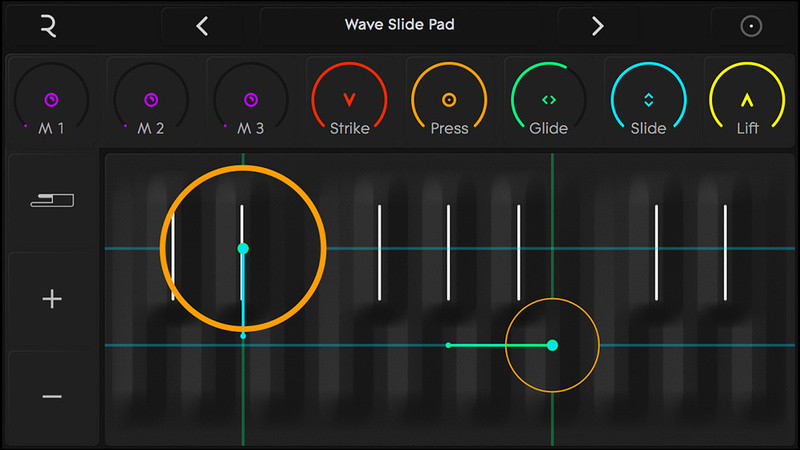 Well, if you have at least an iPhone 5 running iOS 9 or later, ROLI have just the app for you: Noise, a virtual Seaboard that includes a sound engine based on the company’s Equator synth. If you’ve seen the Seaboard Rise (reviewed in SOS February 2016 issue), Noise’s interface should look immediately familiar as it mimics the appearance of the real thing. Noise was originally called Noise 5D when it was first released, the 5D appendage referring to the five ‘dimensions’ of expression the instrument makes possible: Strike, Press, Glide, Slide and Lift. Strike is the initial velocity, Press is the pressure sensitivity, Glide is the horizontal pitch sliding, Slide is the vertical, and Lift is when you release the key. Now, you might be thinking, how does an iPhone or iPad deal with velocity or pressure? And the answer is, of course: it doesn’t. Well, not unless you’ve got an iPhone 6s, because Noise supports 3D Touch to offer a full Seaboard experience, which is really rather neat. Noise works just fine if you don’t have an iPhone 6s, you’ll just be limited to the three, non-pressure related dimensions.The user interface is configurable, and you can choose between displaying 13, 17, or 25 keys. The 17-keys mode is ideal for an iPhone 6 or 6s, while 25 is more practical on an iPad. You can also specify whether a number of different controls are visible on the display, starting with the option to display none at all. Alternatively, there’s a handy toolbar offering controls that set how much each dimension will influence a sound. For example, if Glide is all the way down, gliding horizontally on the keyboard will result in discrete chromatic steps. This toolbar also includes three sound-specific modulation controls, the same as you get on a Seaboard Rise. The other display modes differ between the iPhone and the iPad, mainly due to the difference in screen size. On the iPhone you can choose whether octave up and down buttons are shown, with either an XY pad or a sustain pedal button. And on the iPad, since the pedal and octave buttons are on the toolbar, you can pick a mode that brings up the XY pad alongside vertical indicators and controls for the parameters shown in the toolbar. As you play the keyboard, various coloured overlays indicate how the different dimensions are being used. Strike, Press, and Lift are indicated with circles, where the diameter of the circle represents the pressure, and horizontal and vertical lines are used to indicate Glide and Slide respectively. With the initial free download, Noise comes with a ‘Fundamentals’ so-called Noise Pack that includes 25 sounds, and three additional Noise Packs are available as in-app purchases. Hybrid Acoustic (£3.99$4.99) provides recreations of acoustic instruments, such as a dulcimer, solo strings, and a steel string guitar. Expressive Electronic (£2.99$3.99) offers bass sounds, pads, plucks, and pulses. And finally, Synthetic Leads (£2.99$3.99) gives you, well, synth lead sounds including an amusing theremin. Overall the sounds are all right, some are fine, some are a little cheesy; but the point is more how the sounds interact with the way you’re playing the keyboard. And it’s here where something that might not sound initially that great in a static performance starts to gain some life. The only part of the user interface I felt was lacking was the sound browser. To pick a sound you can either use the next or previous buttons, or tap the sound’s name to see a list of available sounds. But that’s all there is: a list. There’s no way to browse by category, or Noise Pack, and while there are only 61 sounds available right now, I can see this becoming frustrating as more sounds hopefully become available. But there’s more to Noise than simply imitating a real-life Seaboard Rise. 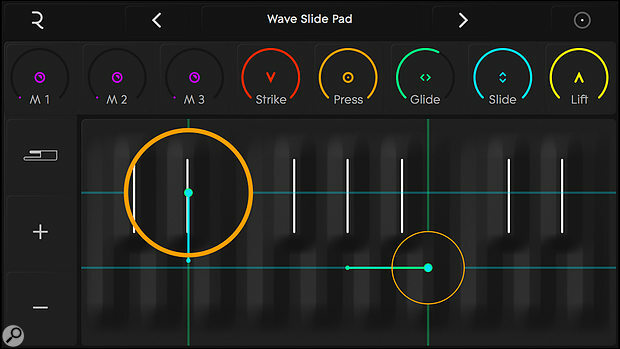 Since ROLI’s latest, lower-cost 25- and 49-key Rise models don’t feature an on-board sound engine but do offer Bluetooth MIDI, you can connect your Rise to your iPhone or iPad and use it as a portable sound source. Good thinking, ROLI! I happened to have a Rise kicking around, so I decided to try this out. Connecting was easy: simply turn the Rise on so that it enters Bluetooth pairing mode, click the Connect button in Noise’s settings, select the Rise when it shows up, and that’s it. Initially, the Bluetooth operation had some reliability issues, but this is working much better with recent Rise firmware releases. A nice touch is that the graphic overlays are still displayed if you’re triggering Noise from a Rise rather than from the touchscreen. Noise supports MIDI input via Bluetooth or USB, making it possible to trigger the app from other controllers or other apps — it’s just most other controllers obviously won’t support the multi-dimensional aspect. There are some exceptions, though, given that Noise supports MPE (Multi-dimensional Polyphonic Expression), a new standard that extends the existing MIDI specification for controllers and instruments that implement multiple dimensions of polyphonic expression. This means you can also use Noise with controllers that support MPE, such as Roger Linn Design’s LinnStrument. If you have a Seaboard Rise already, it perhaps goes without saying that you should download Noise straight away. And iPhone 6s owners might also want to check it out as it’s a particularly good example of how 3D Touch can be used in a musical context. And if you’re considering the purchase of a Seaboard, think of this app as perhaps the greatest brochure any instrument manufacturer has ever created!